New York, Aug 3 (Just News): The UN Security Council is poised to back a US proposal aimed at removing some of the hurdles that tough sanctions on North Korea have thrown up in the way of delivering humanitarian aid, according to documents obtained by AFP. North Korea’s humanitarian crisis has left about 10 million people —nearly half of the population – undernourished, according to UN officials, who have reported a drop in food production last year. UN resolutions specify that sanctions should not affect humanitarian aid but relief organizations argue that strict trade and banking measures are creating bureaucratic obstacles and slowing down the flow of vital supplies. A US proposal put forward last month would provide clear instructions to aid organizations and governments to apply for UN sanctions exemptions for North Korea, according to the text seen by AFP. After weeks of negotiations, the UN sanctions committee is expected to give final approval to the new guidelines on Monday. 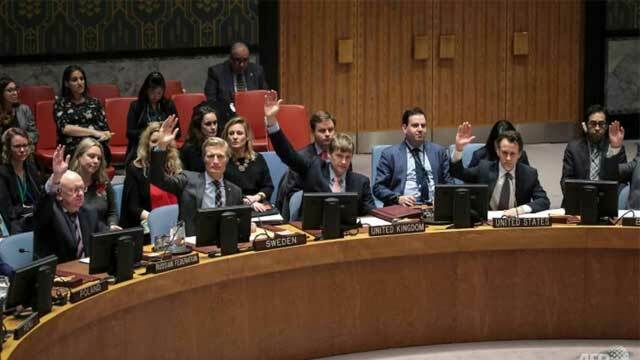 Once approved, a notice will be sent to the UN’s 193 member-states by the committee “to provide a clear explanation of its comprehensive humanitarian exemption mechanism” which will “improve the delivery of humanitarian assistance to DPRK,” according to the documents. The move comes as the United States is calling for maximum pressure to be maintained against North Korea to compel Kim Jong Un to follow through on his pledge to denuclearize the Korean peninsula. After Russia and China urged the council to ease sanctions, US Ambassador Nikki Haley said the United Nations should not do “one thing” until North Korea takes action to dismantle its nuclear and missile programs. A US official said the guidelines would ensure that “only critical, life-saving humanitarian activities needed in North Korea can continue” and that requests for exemptions will undergo a detailed review. “The United States has been very clear that we will continue to enforce the current sanctions until we achieve the final, fully verified, denuclearization of North Korea,” said the official, speaking on background.